← Breaking up the Tea Party: Raising the debt ceiling. German Chancellor Angela Merkel’s government announced late last month that it would phase out nuclear power by the end of 2021. The last few months had seen several shifts in policy, as well as a great deal of public outcry. The Social Democratic/Green coalition government that Merkel’s conservative followed, had announced a similar timetable for the end of nuclear power, but last fall Merkel put that decision on hold. After the tragic Fukushima nuclear accident in Japan, protest against nuclear power revived all over Europe. Merkel’s government responded to the protests, the accident, the increased costs and political difficulties of continuing nuclear power, and a broad public concern with nuclear safety. Although German protesters against nuclear power surely wanted more than a decade-long phase out, this is a clear victory for the movement against nuclear power. To understand how, however, we need to go back much further than the last round of protest or the Fukushima disaster–or even the last government. In Germany and in the United States, perversely aided by reactor accidents at Three Mile Island (Pennsylvania) and Chernobyl, activists were able to slow the growth of nuclear power. It’s not that nuclear power was ever banned, but protests led to increased government regulation (to ensure safety) and increased costs. By the 1980s, campaigns against nuclear power had shifted to campaigns against nuclear weaponry. 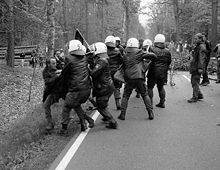 In Germany, local activists developed into a national party, the Greens, explicitly concerned with the environment and peace. The establishment of the Greens as a minor party made it possible for the Social Democrats to govern with a coalition that extended left, rather than right, and to announce a phase out years ago. Over time, antinuclear activists had worked successfully to change public opinion about nuclear weapons, to encourage the development of alternative energy, and to build political institutions that could mobilize around new political opportunities. Their efforts slowed the development of nuclear power. When Chancellor Merkel approaches the phase out of nuclear power in Germany, she must look to replace roughly 25 percent of Germany’s electric power. That’s a little bigger share of the electricity grid than in the United States, and a little less than in Japan. It’s much much less than in France, where nuclear power generates roughly 70 percent of the electricity. By fighting a war of position, over a very long time, the antinuclear movement confined nuclear power to a slice of the electricity grid that the government could ultimately replace. Each small, often invisible, victory on the margins added up to a larger whole that made a bigger victory possible, dependent upon all kinds of awful contingencies. It’s hard to think that the activists at Wyhl, offered the promise of shutting down all nuclear power in Germany nearly fifty years later, in the wake of a terrible nuclear accident elsewhere, would have seen such an outcome as a victory. But it is. This entry was posted in Uncategorized and tagged Angela Merkel, Germany, Japan, movement outcomes, nuclear power, Seabrook, Wyhl. Bookmark the permalink.